The training you will need to give your Husky is not going to be easy. It will require time, patience, and your watchful attention for many weeks, if not months. Despite this effort you might not win. Some dogs can’t shake that prey drive even for family cats. You need to think about a Plan B, such as physically separating kittens from puppies full time. And although we hope it would never happen, Huskies can and do kill cats, should the two of them cross paths. 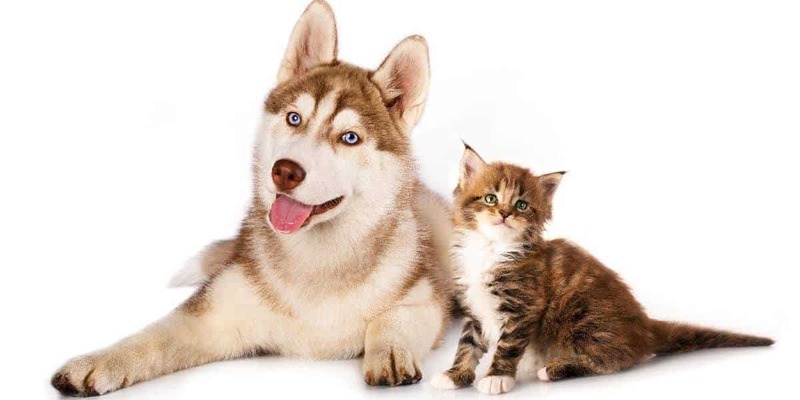 It might not be a pleasant thought but you need to be mindful of the potential consequences of co-habitating a Siberian Husky with a cat. Start training early in the dog’s life. There are lots of training articles on Husky Puppies Info with general advice on what to do and how to do it. The earlier you start the easier it will be to form good habits in the dog’s mind. Ensure you can physically separate the cat and the dog, each having resting, feeding, and pooping areas. In the beginning only a short amount of time will be spent together so they need a space to feel comfortable in when not training. Exercise your puppy first, before letting him or her spend time with your cat. Exercise can dampen the boisterous nature of puppies, who might be inclined to jump or trample over your cat. Keep your Husky on a leash until you are absolutely, positively, 100% positive he/she will not attack or chase your cat. You probably already know it is risky to send your dog off-leash at the park, and the same applies indoors with smaller animals. Give lots of positive feedback when your Husky “plays fair”. This is the key to helping your Husky understand the cat is part of your “pack”, and not a foreigner. 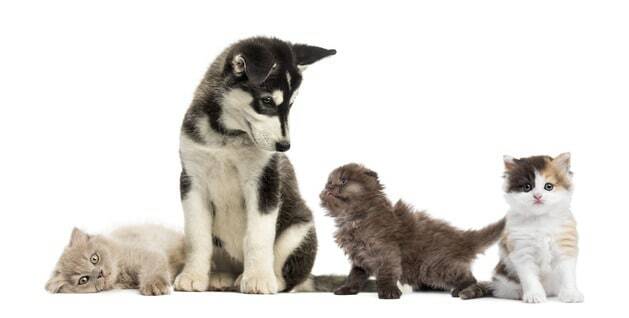 The introductions will require your Siberian Husky on leash, and the cat free to come and go. Ensure the cat can escape to a safe place that he/she already frequents. If you have a small pet door, or a barrier (such as a child gate you jam in a hallway or stairwell) that the cat can squeeze through but not the dog, that’s great! Otherwise just a room that can be closed off will do. It will help if you have a partner so that one of you can manage the Husky, and the other the cat. However if you are on your own that’s ok, just try to encourage the cat to visit the Husky and have a sniff around. Set the dog up so that he or she is in an area that the cat can approach without surprise – visibility for the cat is important. Whilst the dog is on leash, encourage the cat to come up and say hello. It would be natural for the dog to get excited and that’s ok. The important thing is that you have control of the dog, and willing to repeat this process many times until he exhibits calmer and restrained behavior. The first encounter might only last a few seconds before the cat runs away. Don’t forget that cats are curious and are likely to come back for more. Work your way up to 5 minute encounters, and then try for 6, 7, 8 minutes, and longer. Keep this up for a month until you can have substantial sessions together (such as 30 minutes) without any major problem. If your Husky jumps for the cat or displays other predatory behavior, issue feedback with a firm “no”. No need to punish the dog, rather issue praise and positive feedback when he shows restraint. At one point you will have the husky off leash. Still make sure you have the cat’s safe place open so they have somewhere to run to if frightened. Otherwise keep close to your Husky and be prepared to grab the collar if he or she gets rough. With a bit of luck your cat and dog are starting to get along nicely! Of course it might take many weeks or months of supervision to gain the confidence that they won’t hurt each other. It is quite ok to have the two separated every time you are out of the house, just in case something does happen. Aggressive behavior by either animal are a sign that the relationship needs further work. Cats tend to wave their tail when anxious, take swipes with their paw, and stare intently at their foe. Huskies tend to get excited and move a lot, maybe try to pick the cat up in his/her jaw. Can Cats and Siberian Huskies Live Together? With patience and a bit of knowledge you might just pull it off – introducing two natural foes to each other and have them get along. It’s not an easy process and given the choice, not one most Husky owners want to deal with. Just remember to take things slow and give lots of positive feedback to your Husky when he or she behaves nicely around your cat.